827) Egypt ... Deal or No Deal ?!!! President or No President, Constitution or No Constitution, Government or No Government, Parliament or No Parliament, Trails or No Trials, Protests or No Protests .... Simply everything and its exact opposite that I am afraid one day it is going To Be or Not to Be. Egypt became a big darkroom where groups of blind people are left together going in ALL directions and NO direction at the same time !!.. Everybody is running, shouting, and even stepping on others, although we are in a deep need to hold hands and find our way up to switch on the light. After 20 months from the 25th of Jan "Revolution", things are not only in complete unrest, but also the vision, path and even the vehicle are not clear at all.. Each group is living in a separate schizophrenic bubble where they only talk and don't even listen to their own words to the extent that"Contradictions" can easily win the best title for such stage... Liberals aren't liberal enough to accept differences, Salafi's are not following the right Salaf in dealing with others, and socialists are not doing any benefit on any social level, Ekhwan are not tolerant enough to deal with such huge responsibility that they cant handle alone and where they failed to get Egyptians to be "Ekhwan" in this nation.. Even felool, you can't accurately describe what is meant by the term anymore!!! Simply Every Thing and Its opposite...Kol 7aga wel 3aks! 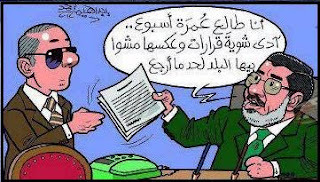 This is the situation about almost everything in Egypt now ... So is it a Deal or No Deal?! The problem is there is no one offering a DEAL; however, everybody is saying NO DEAL !! !